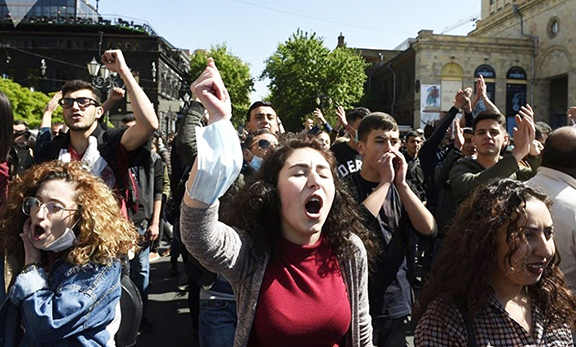 YEREVAN—Demonstrators protested at the US Embassy in Armenia voicing their anger at President Barack Obama’s congratulatory message to Serzh Sarkisian, saying the US had no right to validate an election that was fraudulent. On Saturday, Sarkisian received a congratulatory letter from Obama, and immediately posted it on the presidential Web site. I would like to congratulate you on your reelection as President of the Republic of Armenia. I look forward to continuing our work together as we both begin our second terms. As we move ahead, I would like to build on the strong ties between our countries and peoples, and to further expand our partnership. We remain strongly committed to Armenia’s development and look to your leadership to promote continued improvements in democracy and the economic reforms that will present opportunities to both the people of Armenia and the Americans looking to invest in a valued partner with significant potential. We will continue to strongly support progress in the Nagorno-Karabakh peace process, which requires meaningful movement toward a settlement that provides lasting peace and security. We also want to continue our work to promote the eventual normalization of Armenian-Turkish relations. Your reelection presents opportunities to advance the relationship between our two countries and to build your legacy as a leader who solidifies Armenia’s reforms and furthers the cause of peace for your people and the people of your region. You can be assured that the United States, as Armenia’s enduring friend and partner, stands with you in working to achieve these worthy goals. Mr. Obama cares less about Armenia and Armenians, for him is business as usual.